Be the life of the big day with this romance and fairy-tale style little baby girl dress. Ivory chiffon little dress comes with same colored tulle fabric as lovely decoration along the scoop neckline, shoulder straps and waist part in ruffles style and the skirt hem in four layers cupcake. These details adds more sparkle and cute to the whole dress and beautifully defined the dress for a garden or beach themed wedding. Bridal quality chiffon skirt is full length and box pleated style. This graceful ruffled tulle ivory chiffon wedding little girl dress is fully lined with soft fabric so it is comfortable to wear. We are sure your little one will feel like a super star in this boho style little girl dress. Category: Flower Girl Dresses. Tags: boho style, cupcake hem, ivory chiffon, ruffles tulle, scoop neckline. 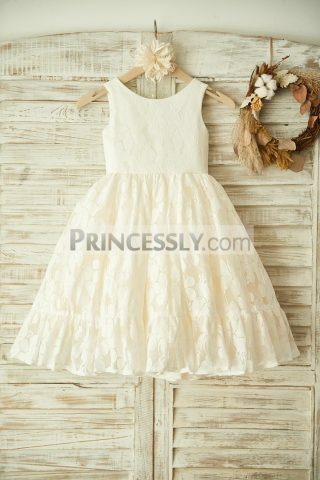 Be the life of the big day with this romance and fairy-tale style little baby girl dress. Ivory chiffon little dress comes with same colored tulle fabric as lovely decoration along the scoop neckline, shoulder straps and waist part in ruffles style and the skirt hem in four layers cupcake. These details adds more sparkle and cute to the whole dress and beautifully defined the dress for a garden or beach themed wedding. Bridal quality chiffon skirt is full length and box pleated style. This graceful little dress is fully lined with soft fabric so it is comfortable to wear. We are sure your little one will feel like a super star in this boho style little girl dress. Be the first to review “Boho Beach Ivory Chiffon Tulle Wedding Flower Girl Dress” Click here to cancel reply.